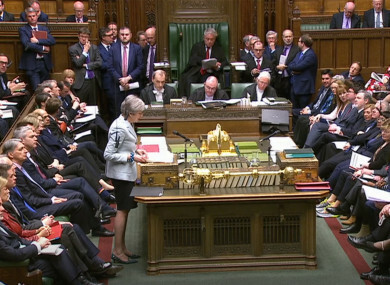 THE HOUSE OF Commons has voted to hold a series of Brexit votes on Wednesday, after Prime Minister Theresa May said that her Brexit deal doesn’t currently have enough support to pass through parliament. Earlier today, May said that she was skeptical of indicative votes strategy, as it could lead to “contradictory outcomes or no outcome at all”. Tonight, MPs voted in favour of taking control of parliamentary time on Wednesday to vote on the Brexit options in a series of indicative votes in what isn’t a legally binding vote, in what was dubbed the Letwin amendment. In a majority of 27, 329 MPs voted in favour of the amendment, and 302 voted against. Later on, when the vote was held again once other amendments were voted down, the amendment was passed by the exact same majority: 327 MPs in favour and 300 against. Business minister Richard Harrington and Foreign Office minister Alistair Burt were among those who voted for the amendment in defiance of May – Harrington then announced his resignation. In a letter to the Prime Minister, he said that he feared the “widespread and longstanding” ramifications of a no-deal Brexit, and said that he was resigning to stop this from happening. Reports earlier today in the British media had indicated that May would put her deal forward for a vote tomorrow, but as tensions flare between her and the DUP, the party supporting her Tory government, May said that the vote would not be held until later in the week. Hardline Brexiteers had indicated that they would vote for May’s deal if the DUP were happy with it; but the DUP have thus far only called for changes to the backstop in the Withdrawal Agreement, which May flatly ruled out in parliament today. If May’s deal is not passed by the House of Commons this week, the extension offered by the European Union last week indicates that the UK parliament must offer a new way forward, or else it would leave the EU without a deal on 12 April. As part of a condition for the second rejection of the Withdrawal Agreement, May said that she would place a “neutral” motion down in order that MPs could propose amendments and indicate a way forward for the government. The results of these votes are not legally binding but simply a statement of intent. Amendment (f) states that if the UK is 7 calendar days away from leaving the EU without a deal, the Government must call on MPs to vote for that option. Amendment (d) wasn’t moved, which doesn’t really matter as it was a weaker version of amendment (a), and could have split the vote of those who want parliament to take back control. Amendment (f) was rejected by a narrow majority of 311 for to 314 against. Email “'Take back control': MPs vote to hold series of Brexit votes on Wednesday”. Feedback on “'Take back control': MPs vote to hold series of Brexit votes on Wednesday”.